Much like we wrote about the value of vendor-led events, there is a tangible benefit in being certified in specific technologies as there's no escaping the major technology vendors. Their technology is in place across the government and oftentimes is providing the platform on which entire IT infrastructures are designed. Doing a deep dive and getting certified in a technology that is critical to your agency makes you a key resource for ensuring that the systems that rely on that vendor keep running and evolving. AWS Certified Solutions Architect-Associate - Amazon Web Services (AWS) has become a trusted provider in helping government move to the cloud. From civilian agencies to the CIA, many departments are using AWS in some way. Cloud professionals are in high demand and with the ambiguity around how people define "cloud experience," having a certification from one of the leaders in the field can set you apart. Cisco Certified Network Associate Routing and Switching (CCNA) - This network-focused certification can be helpful in government where Cisco products are prevalent. Mobile and IoT are impacting how things connect to the network. Showing that your skills are evolving with the technologies being used can position you well for the highly skilled work required in adapting these changes. MCSA SQL Server 2012/2014 - With a data-driven culture in almost every organization, understanding how data needs to be stored, transmitted, and secured is a critical skill. This Microsoft certification is applicable to almost any agency given the ubiquity of SQL and related Microsoft products. The principles of data management are also applicable across vendor platform. VMware Certified Professional 6 Data Center Virtualization - With a government-wide focus in data center consolidation, a solid understanding of virtualization is key. VMware is widely used throughout government and is an industry pioneer in virtualization, making them well-positioned to provide education on the technology and its applications. [Tweet "Be strategic about the certifications for which you invest your time and money. 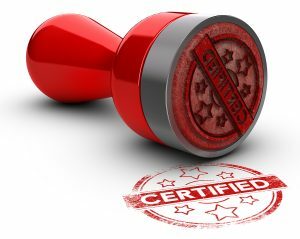 #GovEventsBlog"]Make sure you are strategic about the certifications for which you invest your time and money. Is that technology used in both your current role and in roles you'd like to have in the future? Make sure any certification you earn will continue to offer value for years to come. We'd love to hear your thoughts on which vendor certifications have been most useful in your career. This entry was posted in Event News Articles and tagged Amazon, certification, Cisco, Cloud, database, Microsoft, network, Virtualization, VMware, web services by Kerry Rea President of GovEvents. Bookmark the permalink.